In the last few years there has been a surge of interest in products that are deemed as being all natural. Words and phrases such as “green”, “eco-friendly”, “sustainable”, “paraben-free” and “all natural” have become buzz-words in the beauty industry. Many people pride themselves on using exclusively “natural” products. And while there is absolutely nothing wrong with this, sometimes it can be unclear what “natural” really means. A lot of products out there on the market may have those reassuring labels but may not be 100% natural. Like with the food industry, there are many ways that companies can use clever marketing and packaging to suggest that a product is natural and eco-friendly when in fact they are not. Because the government has not completely defined what natural means in terms of food and beauty products, there are very thin regulations about what products can contain and what designates a product as being natural. Despite the popularity of natural products, products are not necessarily of a lesser quality or harmful because they contain artificial ingredients. For example, there seems to be an overall consensus that parabens (a synthetic ingredient in many cosmetics that prohibits the growth of microorganisms such as fungus and bacteria) are cancer-causing and toxic. Many people go out of their way to avoid all products that contain them, despite the fact that there has been no official research conducted that has proved that parabens are in any way unsafe. In fact, the research that has been carried out regarding the parabens that are used in the cosmetic and health industry has proven time and time again that parabens are not harmful and do not pose a significant health risk in the small amount that they are being used. That being said, while I myself do use a variety of products, with both natural and synthetic ingredients, I do recognize that there are merits of using natural beauty methods. For those who find it important to use only natural products, the best way to ensure that what you are using is completely natural is to make your products yourself. Not only is it actually a great deal cheaper to make your own skin care products but it is also very easy and I find the simpler the recipe for a product and the fewer the ingredients, the more effective and gentle to the skin the product is. With this in mind, and inspired by a suggestion from the talented lady behind The Urban Gazelle, here are three recipes that I enjoy using in my own skin care routine. Most of the ingredients are very cost-effective and friendly towards most skin types. They are also incredibly quick and easy to make. Coconut oil is one of the best ways to remove makeup. I read an article years ago about the benefits of washing the face with coconut oil (hydrated, balanced skin, fewer blemishes because of the oils antibacterial properties) and initially found it to be a strange concept. For people with oilier skin, you are used to being told to wash your face with oil free products and that oils cause breakouts. While that can be true if the oils are comodegenic, the truth is that washing one’s face with a hydrating, nourishing oil like coconut oil actually breaks down the oils, dirt and make-up on your face, allowing you to rinse away all of that pore-clogging junk leaving behind a hydrated, balanced complexion that is not stripped of all it’s necessary oils like so many cleansers tend to do. I promise that I have never had a breakout as a result of using coconut oil and that if anything I feel it prevents pimples and leaves my skin really soft and glowy. What to Do: This is without a doubt the easiest recipe for a cleanser. Simple scoop out some coconut oil into a small container and put 3-4 drops of tea tree oil into the mixture and stir until well blended. 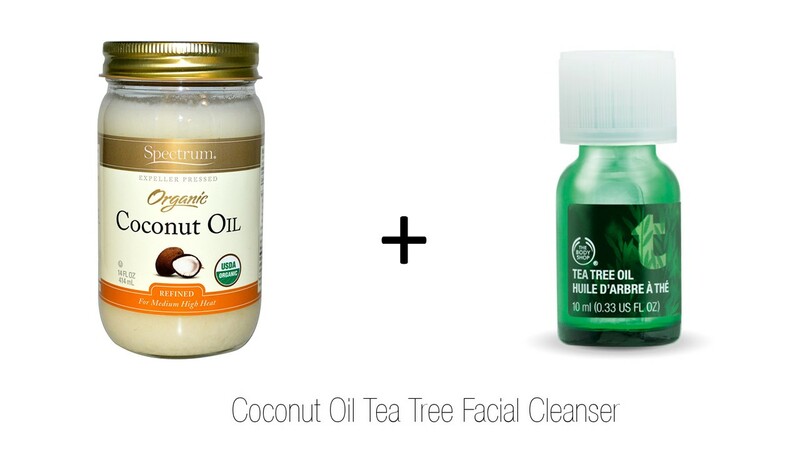 You can add more or less tea tree oil depending on your skin type and how astringent you want the cleanser to be. Simply wash your face how you normally would (avoiding your eyes, use plain coconut oil to wash any eye makeup off) and take it off with a warm damp wash cloth. Roses are known for more than their luxurious appearance and beautiful smell. They have been used in skincare for hundreds of years due to their moisturizing properties. Similarly, lavender is renowned for its ability to reduce stress and balance the skin. It also has natural antiseptic qualities making it a great ingredient in acne-fighting products. Yogurt is incredibly moisturizing and is great for soothing sensitive, irritated skin while green clay is often used to draw out impurities and purify the skin. 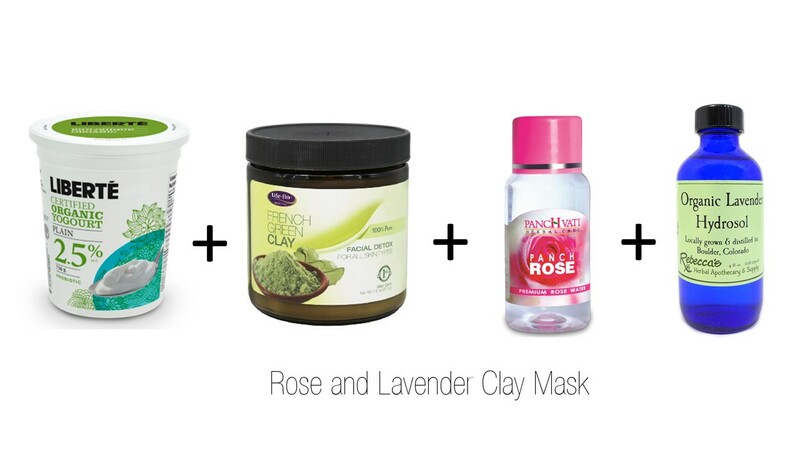 I found the inspiration for this mask here, but modified it switching out the honey for rose and lavender hydrosols. What to Do: In a small bowl mix the ingredients together with a spoon. If you want a thicker consistency, simply add a little more of the clay until it has a creamy texture and goes on smoothly. Pat onto your face, leave for 15 minutes and then rinse off. Enjoy your smooth, hydrated, delicately scented skin. Although most skincare routines stress the importance of using a toner to remove excess oils and impurities, a lot of the toners that are offered in stores contain alcohol and are very dehydrating. 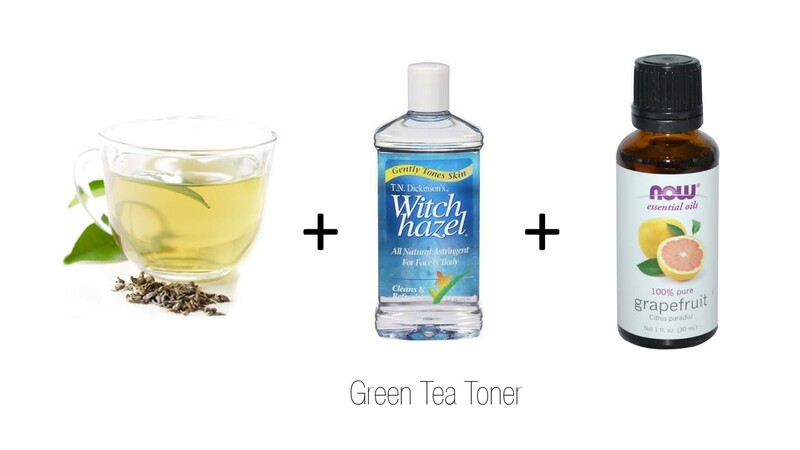 This toner is simple to make, will not dehydrate the skin and has a base of antioxidant rich, fragrant green tea along with witch hazel and a drop or two of grapefruit essential oils. Witch hazel is a natural antiseptic and is a great product to use even on its own as a toner. It helps heal everything from insect bites and pimples to sunburns. I like to add the grapefruit essence for a light and uplifting scent and also because grapefruit oil has lots of antioxidants but it is completely optional. I store this in my fridge overnight but carry it with me in a little spray bottle and I like to spritz this mixture on my face throughout the day to keep my face feeling fresh, clean and balanced. What to Do: simply mix the tea with the witch hazel and essential oil in a small bowl and siphon it into either a bottle or spray bottle, depending on whether you like to spread toner on your face using a cotton bowl or whether you like to mist your face with it instead. Store in the fridge when you are not using it. It keeps for about a week and a half when kept in the fridge which it why I tend to keep the portions small for each batch. The green tea especially, has a very brightening effect on my skin and I really enjoy using this during summer months for its fresh smell and healing, cooling effect on my skin. I hope you enjoy these easy, all natural skin care recipes. For any of you who try them out, I would love to know what you think and if you have any other all natural beauty recipes you think I should try, please let me know in the comments. Happy Monday!